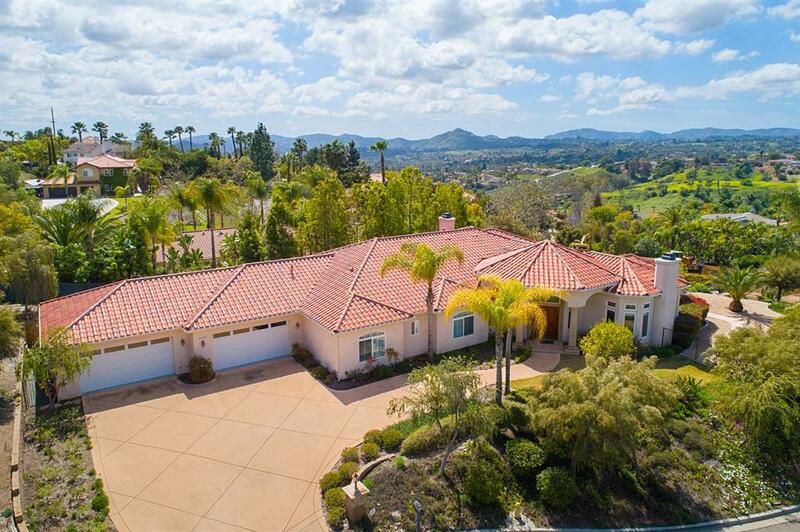 Beautiful custom single level Mediterranean style residence located on a quiet cul-de-sac with panoramic mountain & park-like views. Gorgeous finish work includes slab granite counter tops, alder wood cabinetry, stainless steel appliances, plantation shutters, travertine flooring, crown molding, 3 fireplaces in 4 rooms, pool & spa, covered patio, entertainment island, 4 car garage + easy access to I-15 & HOV lanes. 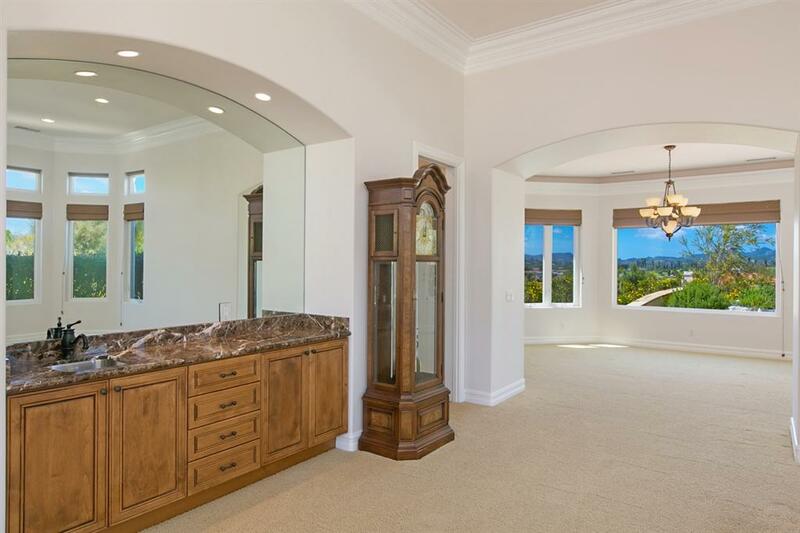 Canyon Views Estates is a quiet neighborhood of custom homes nestled in the hills of Southeast Escondido. The location is conveniently close to Westfield Mall, I-15 & HOV lanes, the Vineyard Golf Course & Hodges Driving Range, LR Green Elementary School, Bear Valley Middle School, San Pasqual High School, California Center for the Arts, the San Diego Safari Park, Lake Hodges, walking & hiking trails, shopping & services. Carved over sized double entry doors open to an octagon shaped foyer and a travertine medallion with an office located off of the entry. 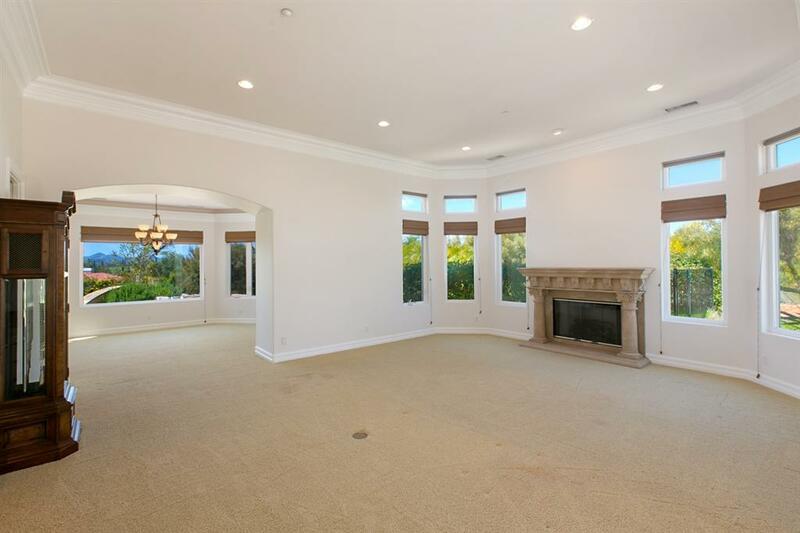 The formal living room has a stone faced fireplace, a curved wall of windows + a marble topped wet bar. View windows grace the large formal dining room with crown molding, recessed lighting, & two built-in china cabinets. The central island kitchen features slab granite counter tops, alder wood cabinetry, stainless steel appliances including a Sub Zero refrigerator, Bosch Dishwasher, Thermador ovens, cook top & microwave, walk-in pantry, butler's pantry, eating bar + a spacious breakfast nook with view windows. Travertine flooring extends from the kitchen into the family room with a stone faced fireplace & French doors to the covered patio. An elegant half bath for guest is nearby. Double doors open to the master suite with French doors to the patio, a see-through fireplace from the sitting area to the bath, large walk-in closet with organizers, jetted tub, travertine tiled shower + dual controls, dual sinks, vanity & bidet. Two spacious secondary bedrooms have their own travertine & marble trimmed baths. Bedroom 4 has an adjacent hall bath. The laundry room has a sink, washer & dryer and lots of storage. Additional amenities include lighted art niches, thick crown molding & baseboards, plantation shutters, recessed lighting, high ceilings, cat 5 wiring, zoned heating & AC systems, rounded corners, hand troweled texturing, custom paint & surround sound speakers. Exterior features include a 4 car garage with epoxy flooring, beach entry pool, spa, BBQ entertainment island & colorful mature landscaping.